2 Sensor network Collection of sensors which can communicate between themselves. Sensors are tiny devices, which can sense their residing environment’s various activities due to their special manufacturing features. 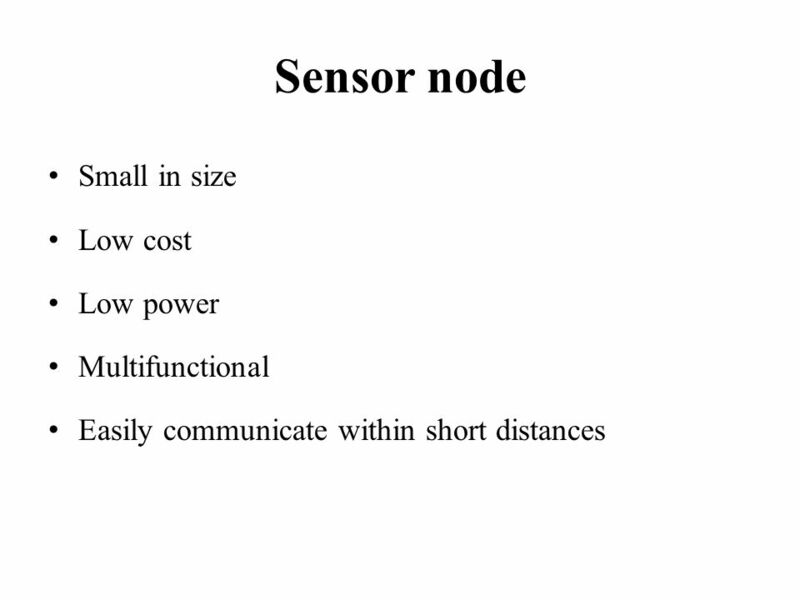 5 Sensor node… Figure 1: An underwater sensor node chip. Environmental Monitoring Animals/Plants Habitat Monitoring Building/Bridges Structural Monitoring Medical diagnostics Natural disaster monitoring Military Applications Traffic monitoring. Smart home appliances. Inventory management etc…. Low power resources Slow communication speed Small bandwidth May not have global identification More prone to failures due to harsh deployment environments and energy constraints Need to be densely deployed in most environments. Radio Transmission Range. 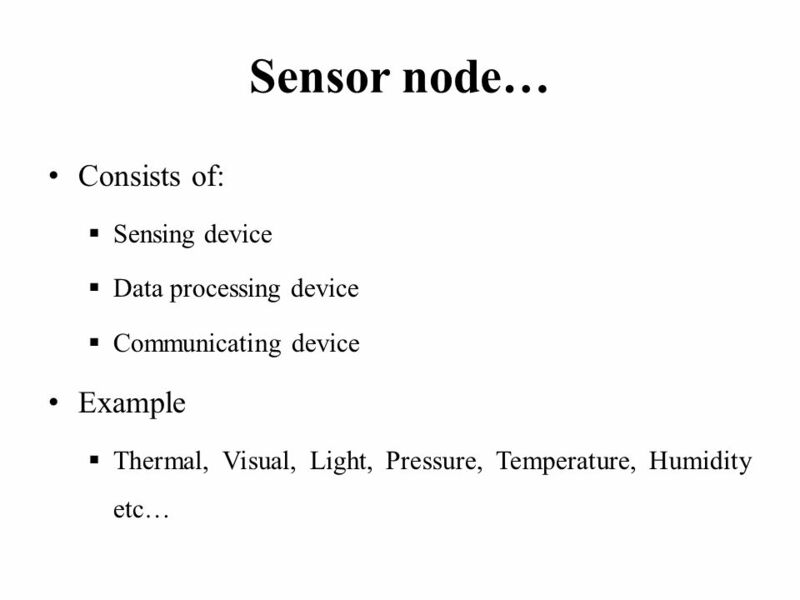 A Sensor Node Figure. 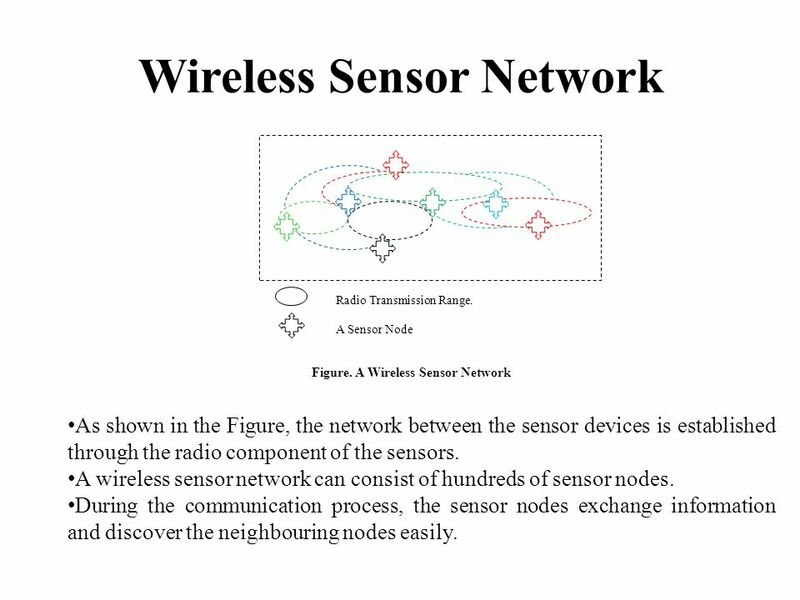 A Wireless Sensor Network As shown in the Figure, the network between the sensor devices is established through the radio component of the sensors. 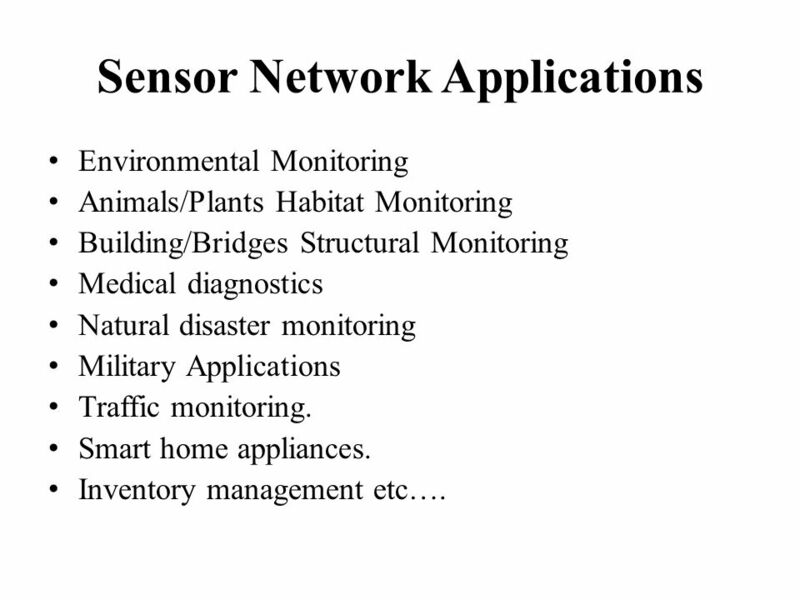 A wireless sensor network can consist of hundreds of sensor nodes. During the communication process, the sensor nodes exchange information and discover the neighbouring nodes easily. WUWSNs are different from the ground-based wireless sensor networks in terms of the communication methods and the mobility of the nodes. 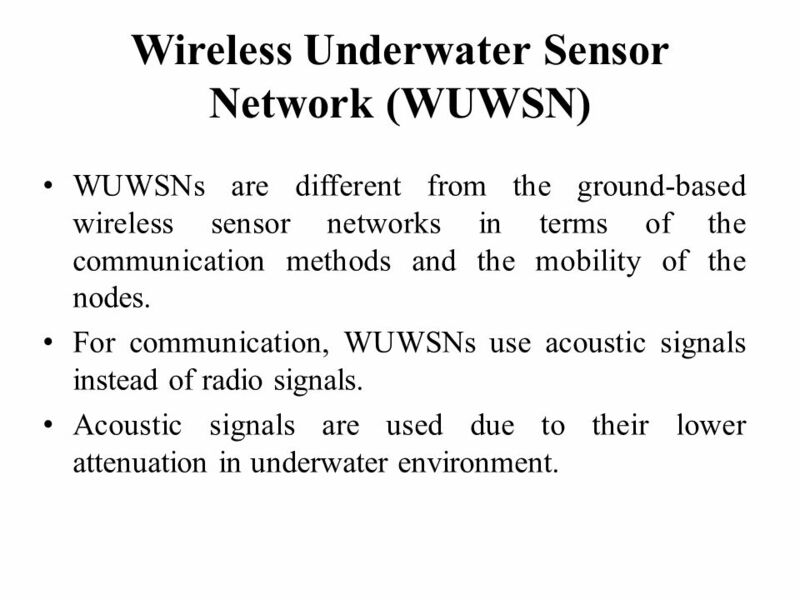 For communication, WUWSNs use acoustic signals instead of radio signals. Acoustic signals are used due to their lower attenuation in underwater environment. 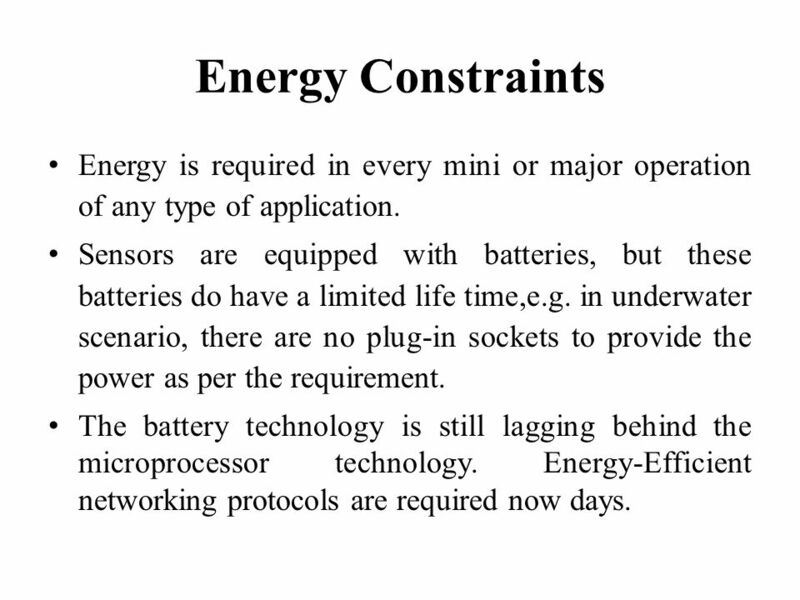 10 Energy Constraints Energy is required in every mini or major operation of any type of application. Sensors are equipped with batteries, but these batteries do have a limited life time,e.g. in underwater scenario, there are no plug-in sockets to provide the power as per the requirement. The battery technology is still lagging behind the microprocessor technology. Energy-Efficient networking protocols are required now days. 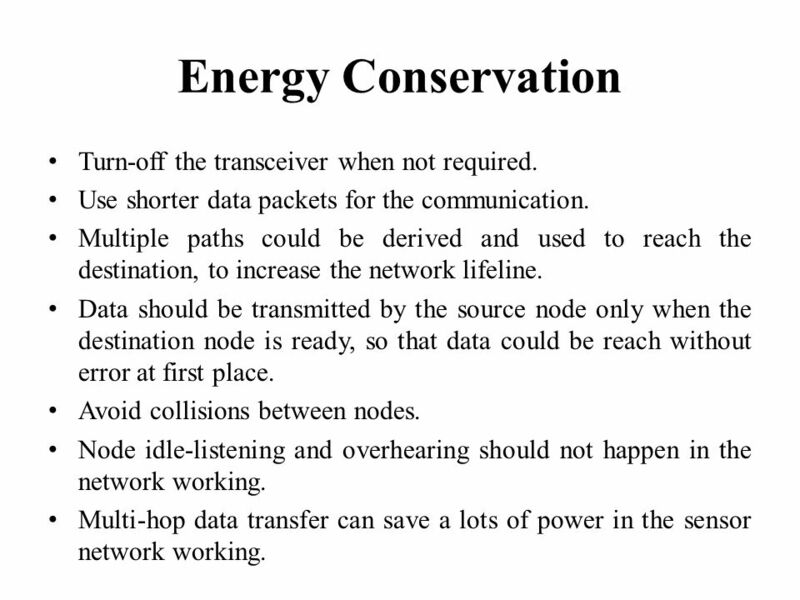 11 Energy Conservation Turn-off the transceiver when not required. Use shorter data packets for the communication. Multiple paths could be derived and used to reach the destination, to increase the network lifeline. Data should be transmitted by the source node only when the destination node is ready, so that data could be reach without error at first place. Avoid collisions between nodes. Node idle-listening and overhearing should not happen in the network working. Multi-hop data transfer can save a lots of power in the sensor network working. 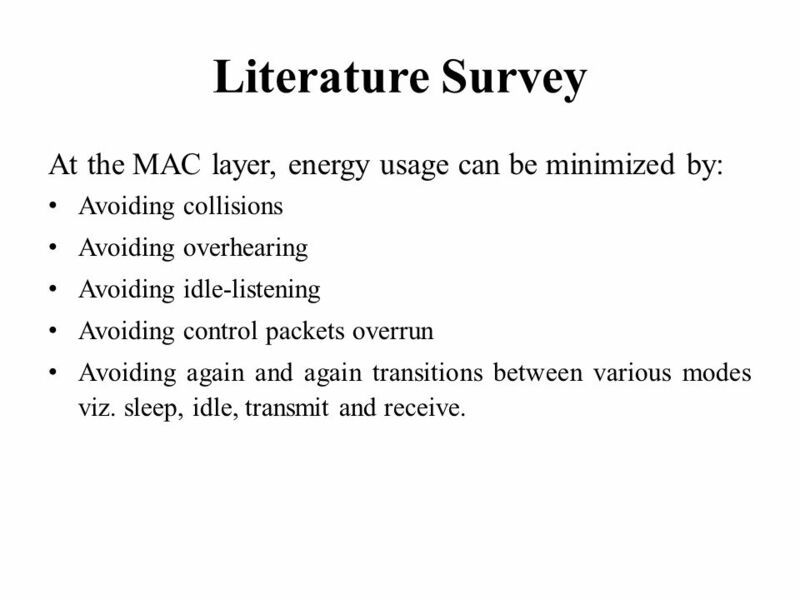 Avoiding collisions Avoiding overhearing Avoiding idle-listening Avoiding control packets overrun Avoiding again and again transitions between various modes viz. sleep, idle, transmit and receive. 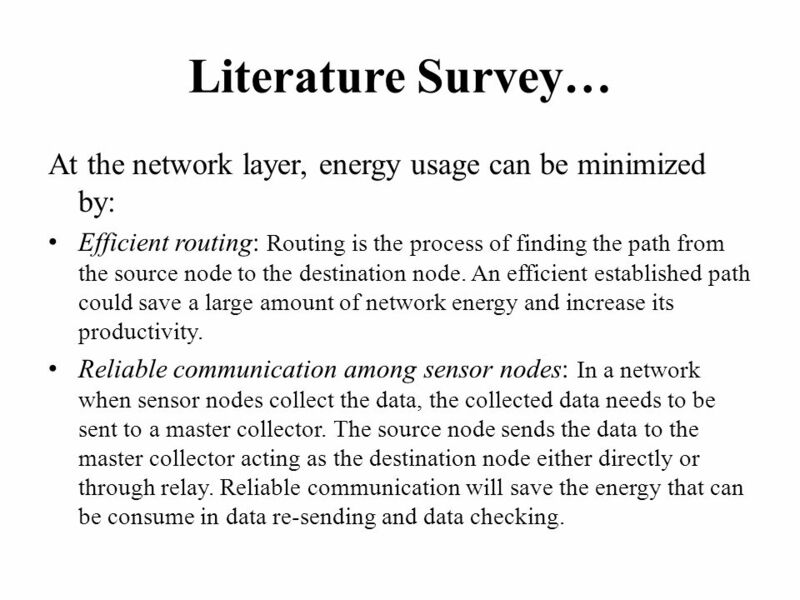 13 Literature Survey… At the network layer, energy usage can be minimized by: Efficient routing: Routing is the process of finding the path from the source node to the destination node. An efficient established path could save a large amount of network energy and increase its productivity. 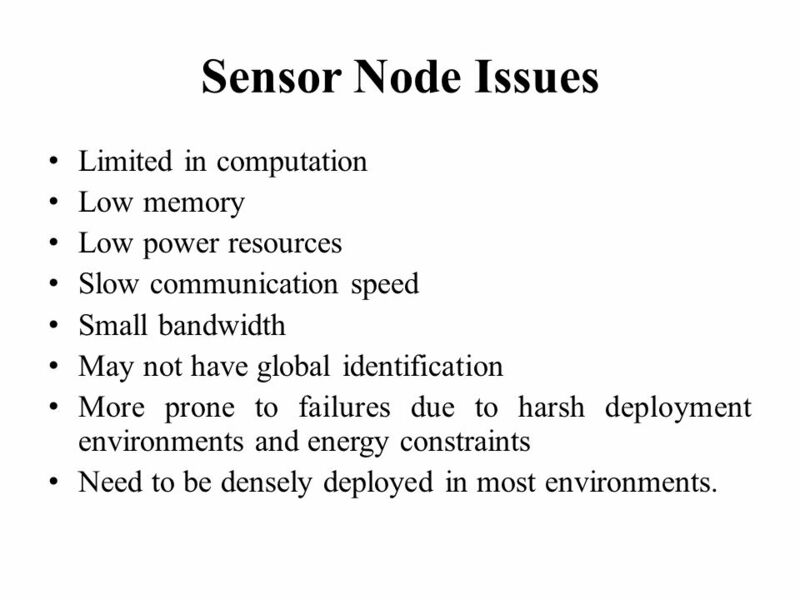 Reliable communication among sensor nodes: In a network when sensor nodes collect the data, the collected data needs to be sent to a master collector. The source node sends the data to the master collector acting as the destination node either directly or through relay. Reliable communication will save the energy that can be consume in data re-sending and data checking. 15 Directed Diffusion Data-centric protocol. 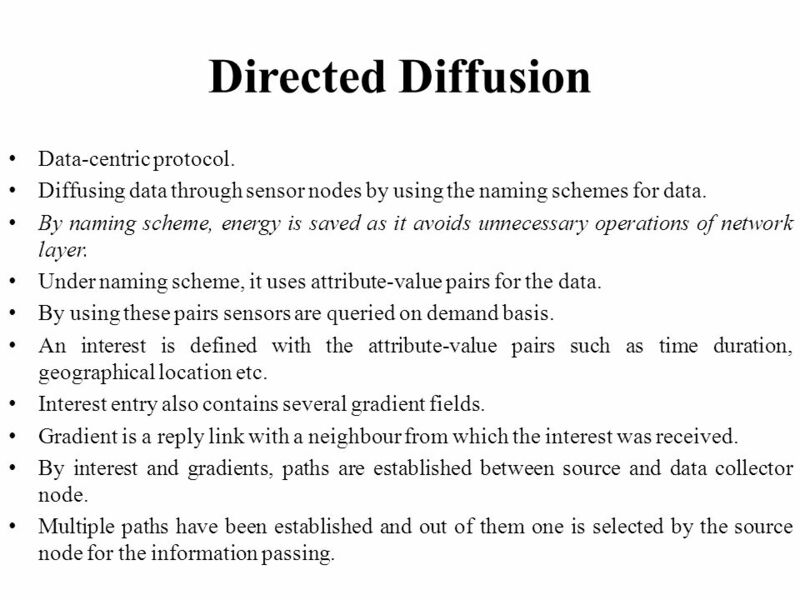 Diffusing data through sensor nodes by using the naming schemes for data. By naming scheme, energy is saved as it avoids unnecessary operations of network layer. Under naming scheme, it uses attribute-value pairs for the data. By using these pairs sensors are queried on demand basis. An interest is defined with the attribute-value pairs such as time duration, geographical location etc. Interest entry also contains several gradient fields. Gradient is a reply link with a neighbour from which the interest was received. By interest and gradients, paths are established between source and data collector node. Multiple paths have been established and out of them one is selected by the source node for the information passing. 16 Rumor Another variation of Directed Diffusion protocol. Applicable where geographic routing cannot be used. Rumor creates the concept of flooding that is between the event flooding and the query flooding. Main Idea is to route the queries to the node that has observed a particular event. This will save the entire network flooding. When a node detects any event, it generates an agent. Agent task is to communicate the information about the event. When a node queried for an event, another node that knows about the route respond to the query by referring its event table. This saves the cost of flooding the entire network. 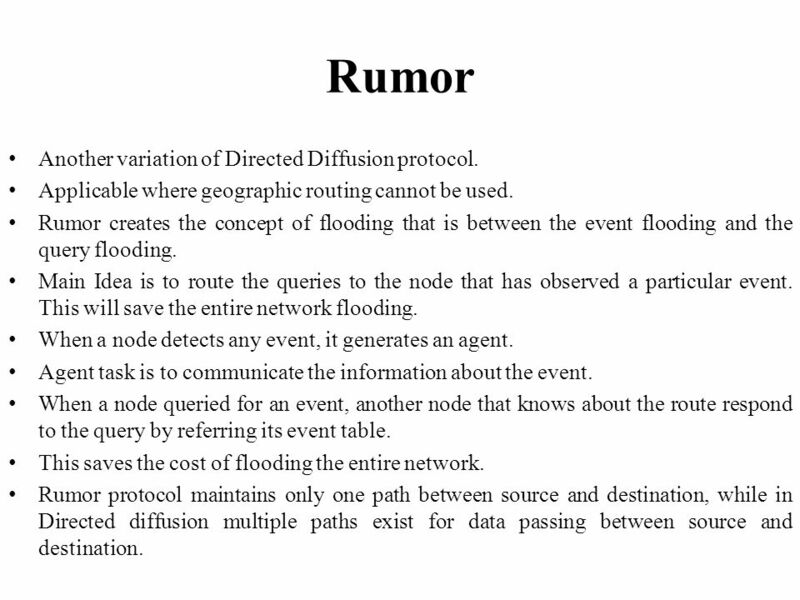 Rumor protocol maintains only one path between source and destination, while in Directed diffusion multiple paths exist for data passing between source and destination. Forms cluster to minimize the energy dissipation. Operation of the protocol is divided into two parts: - Set-up phase and the Steady phase. Steady phase is of longer duration to minimize the overheads. Set-up Phase After selection of cluster-head, it advertises to all of its presence. After advertisement, the other sensor nodes decide whether they want to part of this cluster-head’s cluster or not, based on the signal strength of the advertisement. Cluster-head assign the time-table to the sensor nodes of its cluster based on the TDMA approach. At the indicated time the nodes can send data to the cluster head. Sensor nodes start sensing and transmitting data to cluster-heads. Cluster-head aggregate all the data and send to the base station. 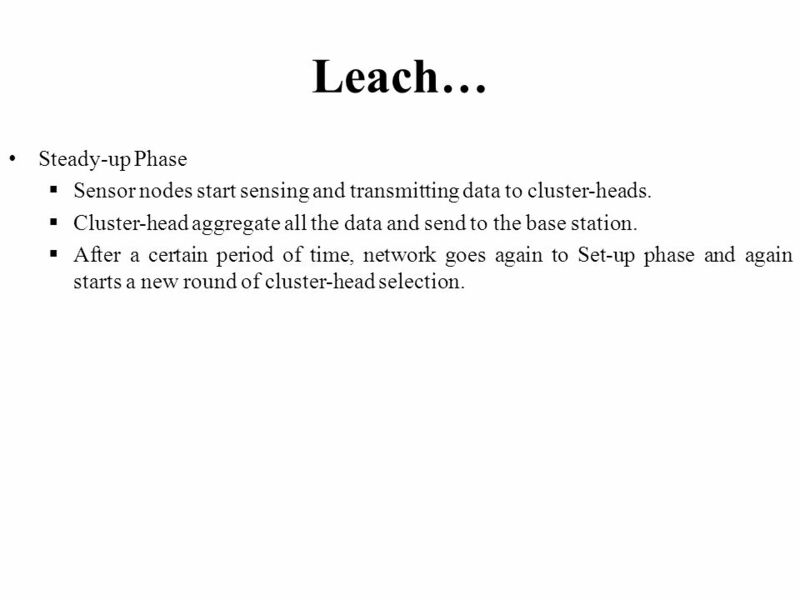 After a certain period of time, network goes again to Set-up phase and again starts a new round of cluster-head selection. 19 E-Leach Energy-LEACH protocol improvement over the LEACH protocol. Changes the cluster-head selection procedure. When first time (at first round), a cluster head is to be chosen, all the nodes have same probability to be cluster-head. After first round, nodes’ energy is also considered in cluster-head selection. 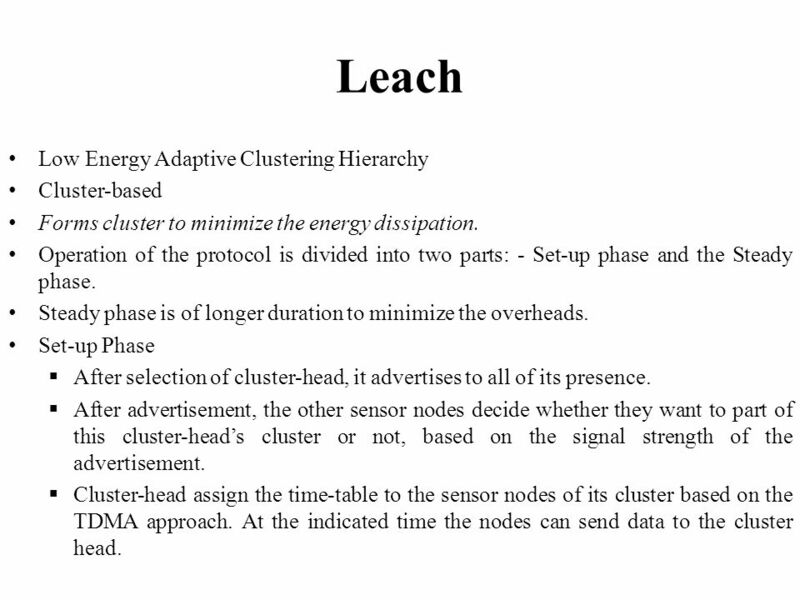 Node with high residual energy is chosen as cluster-head. 20 TL-Leach Two-Level Leach. Sends data to the base station in two hop. Cluster-head collects data from the other nodes. Cluster-head send the collected data to the base station through another cluster-head that lies in between it and base station. 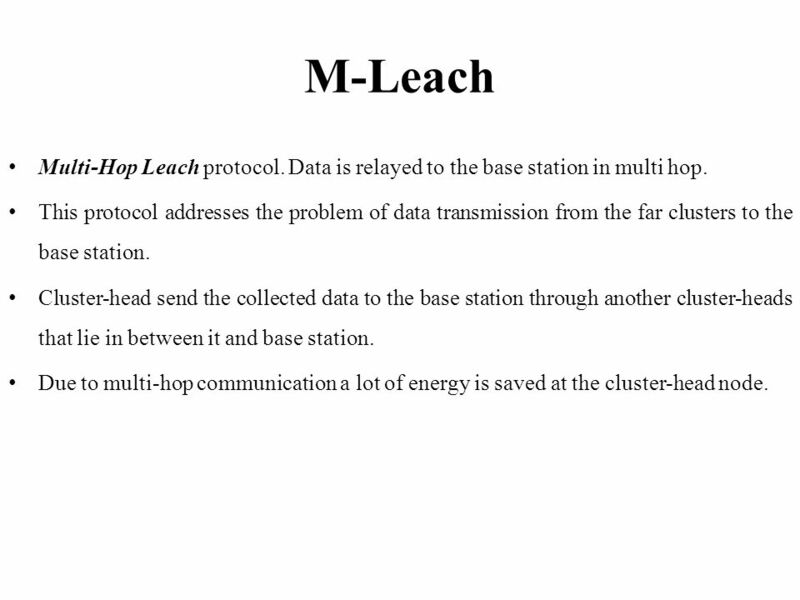 21 M-Leach Multi-Hop Leach protocol. Data is relayed to the base station in multi hop. 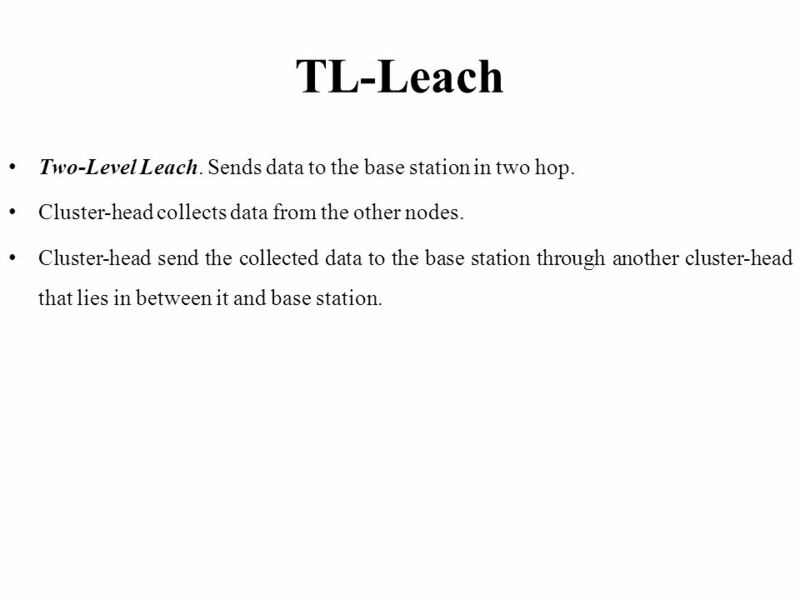 This protocol addresses the problem of data transmission from the far clusters to the base station. Cluster-head send the collected data to the base station through another cluster-heads that lie in between it and base station. Due to multi-hop communication a lot of energy is saved at the cluster-head node. 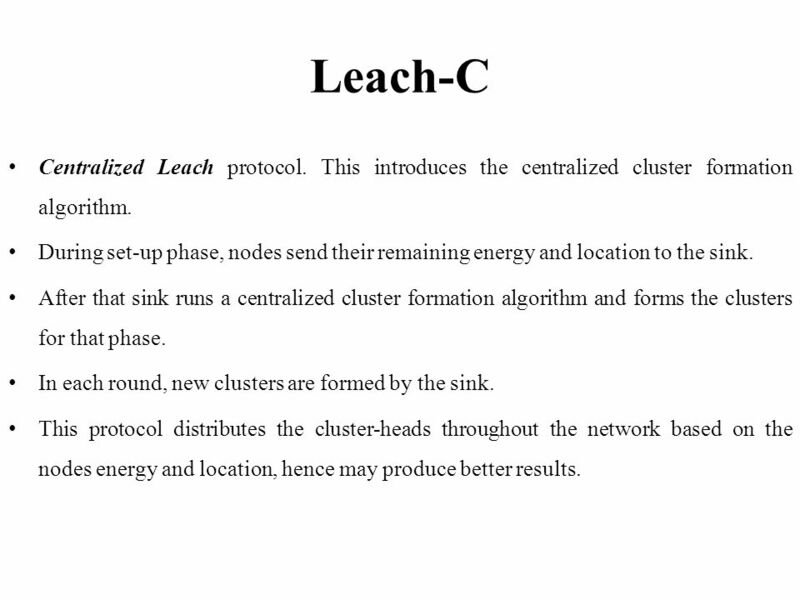 22 Leach-C Centralized Leach protocol. This introduces the centralized cluster formation algorithm. During set-up phase, nodes send their remaining energy and location to the sink. After that sink runs a centralized cluster formation algorithm and forms the clusters for that phase. In each round, new clusters are formed by the sink. 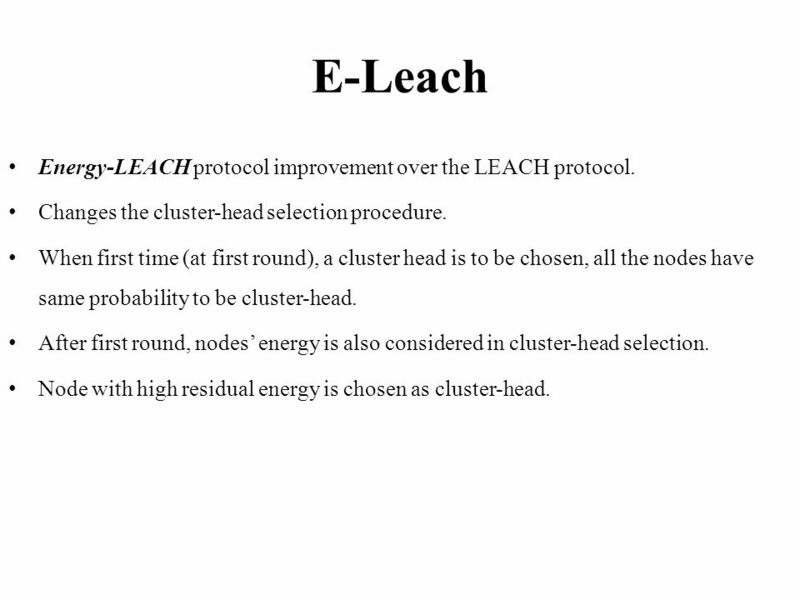 This protocol distributes the cluster-heads throughout the network based on the nodes energy and location, hence may produce better results. 23 V-Leach New Version Leach protocol. 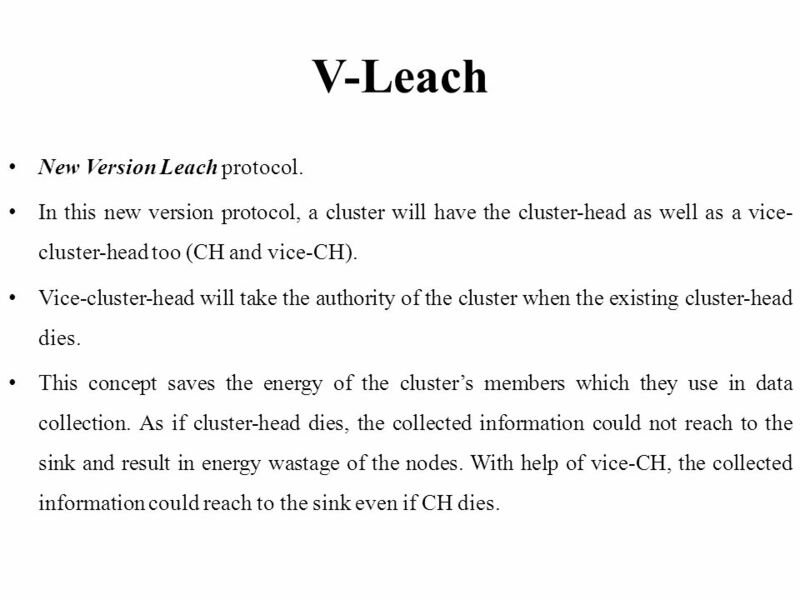 In this new version protocol, a cluster will have the cluster-head as well as a vice-cluster-head too (CH and vice-CH). Vice-cluster-head will take the authority of the cluster when the existing cluster-head dies. 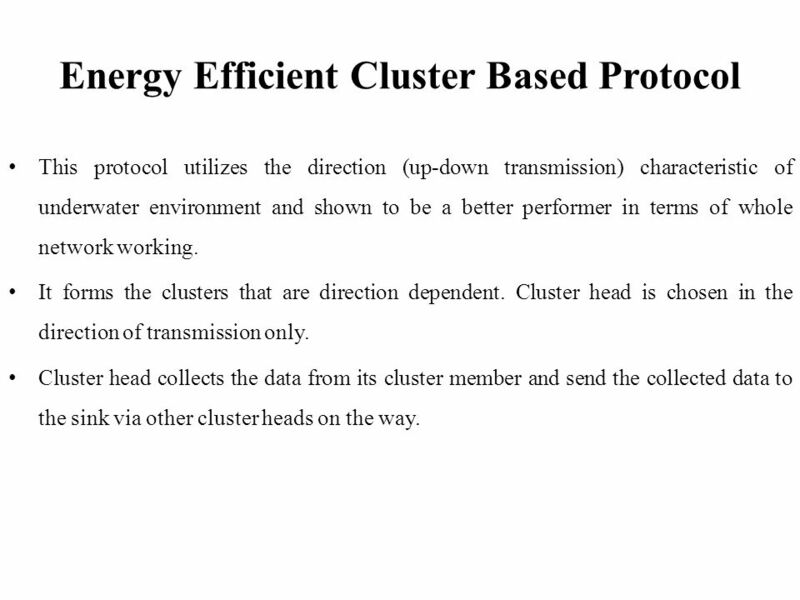 This concept saves the energy of the cluster’s members which they use in data collection. As if cluster-head dies, the collected information could not reach to the sink and result in energy wastage of the nodes. With help of vice-CH, the collected information could reach to the sink even if CH dies. 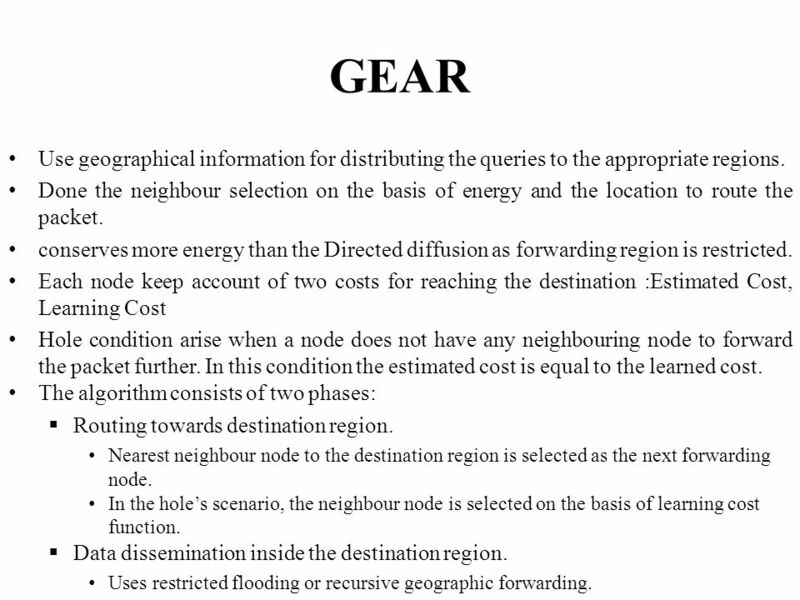 24 GEAR Use geographical information for distributing the queries to the appropriate regions. Done the neighbour selection on the basis of energy and the location to route the packet. conserves more energy than the Directed diffusion as forwarding region is restricted. Each node keep account of two costs for reaching the destination :Estimated Cost, Learning Cost Hole condition arise when a node does not have any neighbouring node to forward the packet further. In this condition the estimated cost is equal to the learned cost. The algorithm consists of two phases: Routing towards destination region. Nearest neighbour node to the destination region is selected as the next forwarding node. In the hole’s scenario, the neighbour node is selected on the basis of learning cost function. Data dissemination inside the destination region. Uses restricted flooding or recursive geographic forwarding. 26 VBF Vector Based Forwarding protocol. It is an energy efficient and robust algorithm. A routing forwarding vector is defined between the source and the destination. A forwarding region is defined around the routing vector consist of a predefined radius. Only a set of nodes that are in forwarding region take part in routing. An intermediate node will be the candidate of next relay node if the distance between itself and the routing vector is less compared to the other nodes. 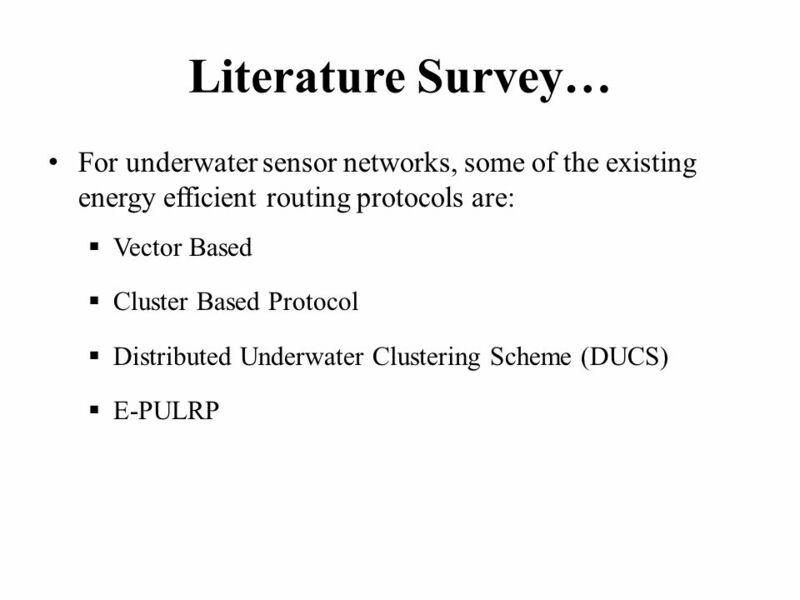 This protocol utilizes the direction (up-down transmission) characteristic of underwater environment and shown to be a better performer in terms of whole network working. It forms the clusters that are direction dependent. Cluster head is chosen in the direction of transmission only. Cluster head collects the data from its cluster member and send the collected data to the sink via other cluster heads on the way. 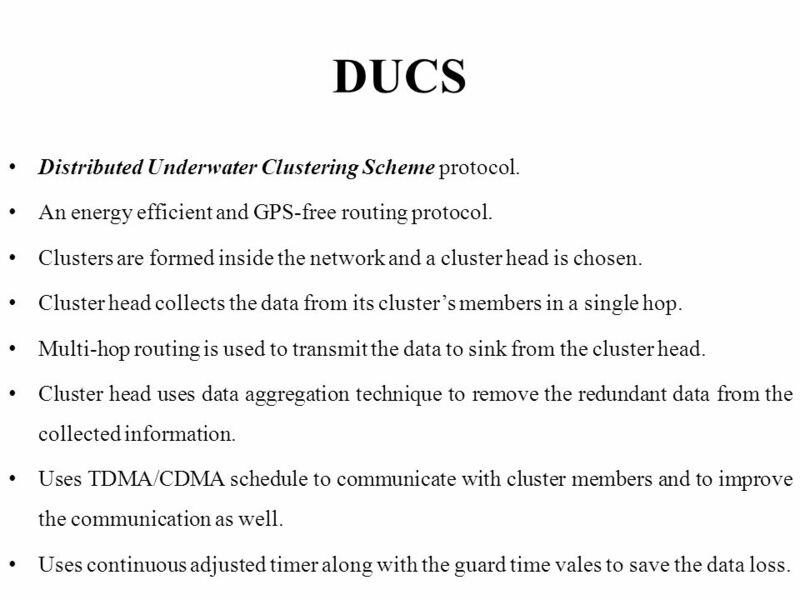 28 DUCS Distributed Underwater Clustering Scheme protocol. An energy efficient and GPS-free routing protocol. Clusters are formed inside the network and a cluster head is chosen. Cluster head collects the data from its cluster’s members in a single hop. Multi-hop routing is used to transmit the data to sink from the cluster head. Cluster head uses data aggregation technique to remove the redundant data from the collected information. Uses TDMA/CDMA schedule to communicate with cluster members and to improve the communication as well. Uses continuous adjusted timer along with the guard time vales to save the data loss. 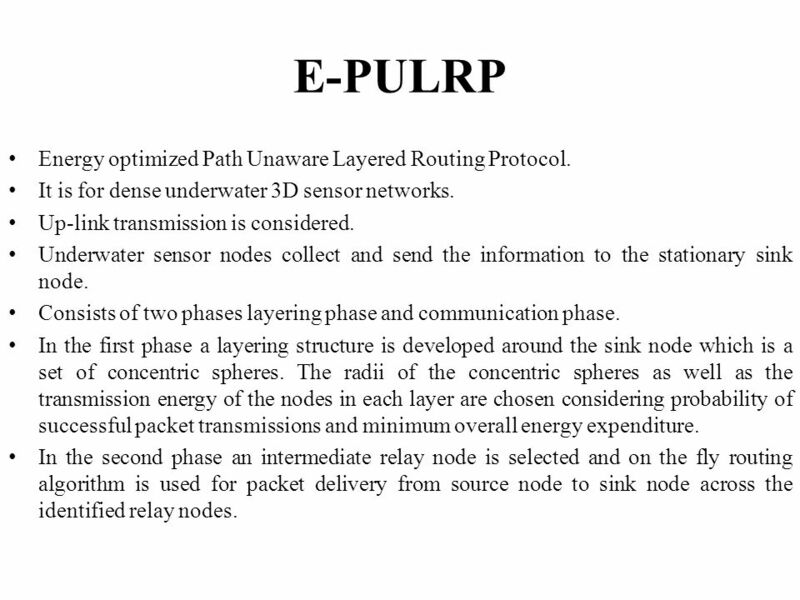 29 E-PULRP Energy optimized Path Unaware Layered Routing Protocol. It is for dense underwater 3D sensor networks. Up-link transmission is considered. Underwater sensor nodes collect and send the information to the stationary sink node. Consists of two phases layering phase and communication phase. In the first phase a layering structure is developed around the sink node which is a set of concentric spheres. The radii of the concentric spheres as well as the transmission energy of the nodes in each layer are chosen considering probability of successful packet transmissions and minimum overall energy expenditure. In the second phase an intermediate relay node is selected and on the fly routing algorithm is used for packet delivery from source node to sink node across the identified relay nodes. 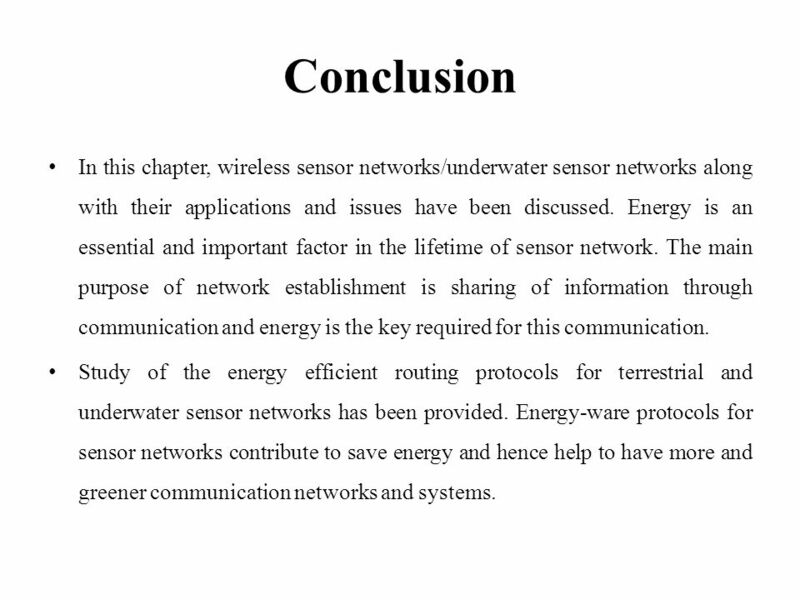 30 Conclusion In this chapter, wireless sensor networks/underwater sensor networks along with their applications and issues have been discussed. Energy is an essential and important factor in the lifetime of sensor network. The main purpose of network establishment is sharing of information through communication and energy is the key required for this communication. 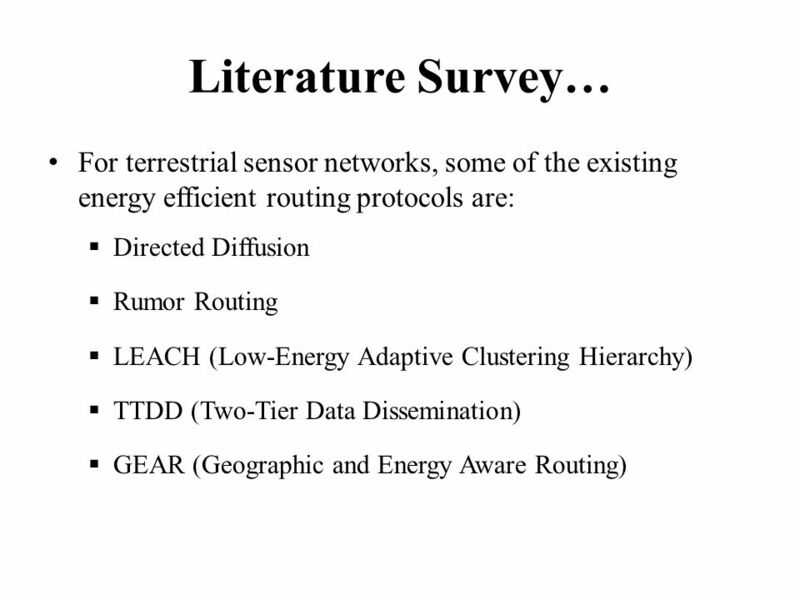 Study of the energy efficient routing protocols for terrestrial and underwater sensor networks has been provided. Energy-ware protocols for sensor networks contribute to save energy and hence help to have more and greener communication networks and systems. Download ppt "Energy-Efficient Sensor Networks"
16-1 ©2006 Raj JainCSE574sWashington University in St. Louis Energy Management in Ad Hoc Wireless Networks Raj Jain Washington University in Saint Louis. ROUTING TECHNIQUES IN WIRELESS SENSOR NETWORKS: A SURVEY Presented By: Abbas Kazerouni EE 360 paper presentation, winter 2014, EE Department, Stanford. COS 461 Fall 1997 Routing COS 461 Fall 1997 Typical Structure. 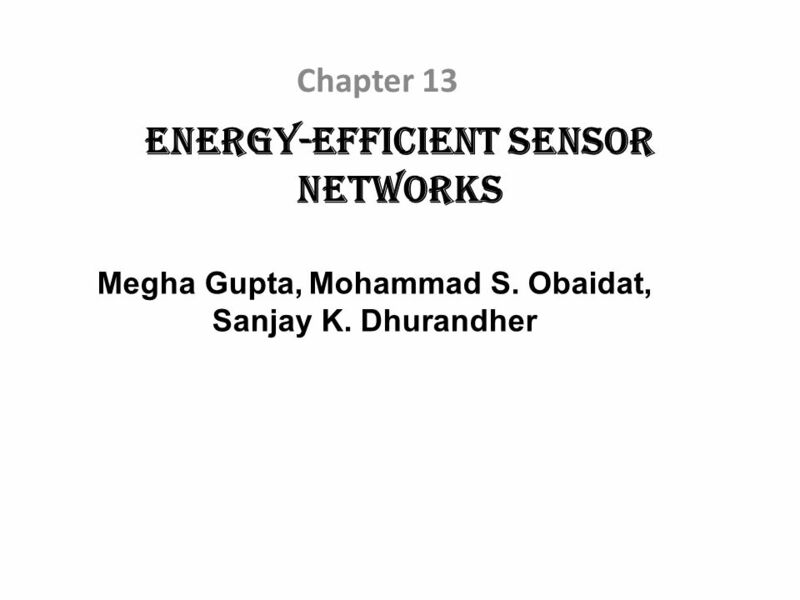 Energy-Efficient Communication Protocol for Wireless Microsensor Networks by Mikhail Nesterenko Wendi Rabiner Heinzelman, Anantha Chandrakasan, and Hari. An Energy Efficient Routing Protocol for Cluster-Based Wireless Sensor Networks Using Ant Colony Optimization Ali-Asghar Salehpour, Babak Mirmobin, Ali. Tufts Wireless Laboratory Tufts University School Of Engineering Energy-Efficient Structuralized Clustering for Sensor-based Cyber Physical Systems Jierui. Sensor Network 教育部資通訊科技人才培育先導型計畫. 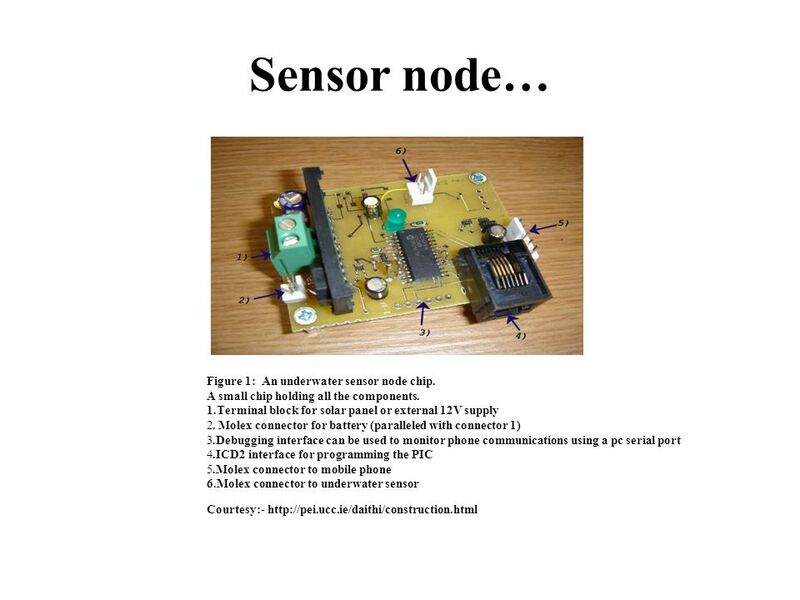 1.Introduction General Purpose  A wireless sensor network (WSN) is a wireless network using sensors to cooperatively. Presented By- Sayandeep Mitra TH SEMESTER Sensor Networks(CS 704D) Assignment. A Novel Cluster-based Routing Protocol with Extending Lifetime for Wireless Sensor Networks Slides by Alex Papadimitriou.